Patriotic Assembly Song of the Week "Caissons Go Rolling Along"
Today we will learn about a leader of swing-style music, Glenn Miller (March 1, 1904 – 1944). Glenn Miller was an American ‘﻿big band﻿’ musician: a trombonist, music arranger, composer, and ﻿bandleader﻿ in the ﻿swing﻿ era of the 1930’s and 1940’s. This is when your great-grandparents were living. Miller was the leading recording artist during World War II. He led one of the best known ﻿big bands﻿, The Glenn Miller Orchestra. During World War II big bands were important because they provided dance music for millions of people who enjoyed dancing for diversion. Big bands of the swing era were really small orchestras because of their size and because they sometimes used violins. Today’s music video on the culture page is called “In the Mood”. Glenn Miller’s creative arrangements for orchestra could captivate a dancing audience to respond to its music. Watch the dancers respond to the band's performance. Frameworks: M.4.3., M.4.4., M.5.1., M.5.2., M.5.5., M.5.6. Glenn Miller created a unique sound for his orchestra when he had one of his saxophone players play a clarinet along with a lower, tenor sax. This made his band have a distinctive sound from others. Here is what makes a big band. Jazz orchestras typically have 5 saxophones; 4-5 trombones; 4 trumpets; a double bass [base], drums and piano. They would also have male and female singers and possibly violins. That can be as many as 18-20 performers. That’s a large jazz band! 1) The amount of wavy vibrato they use when playing -- this creates a warm, fuzzy feeling in the music and makes it sound rich. 2) The brass - trombones and trumpets - often play with mutes over the bells of their horns. This muffles the instrument’s tone, and makes it sound jazzy. 3) The different sections of the band take turns playing a solo or ‘showing off’ during a song. Often the saxophones lead off, since they sound closest to the human voice. Today’s music example is an American folk song that Glenn Miller jazzed up. His arrangement of “Little Brown Jug” highlights the different instruments as they enter the music, and is reported to be one of Miller’s favorite arrangements. 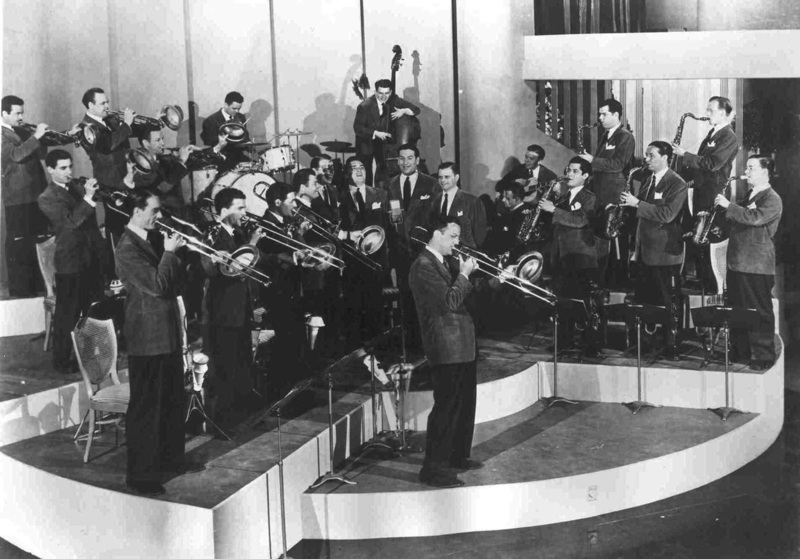 As a teenager, Glenn Miller bought his first trombone with money he had saved up from milking cows on a farm. Throughout his career as a performer and composer, he worked closely with other musicians who would later lead their own big bands. When George Gershwin's musical Girl Crazy was produced in 1930, Glenn Miller sat in the orchestra pit under the stage and played for the musical, along with Benny Goodman on clarinet, Gene Krupa on drums, and other great names in the jazz world. These musicians served as advisors to Glenn Miller. Miller would later help these musicians organize their first bands and get started in the music industry. 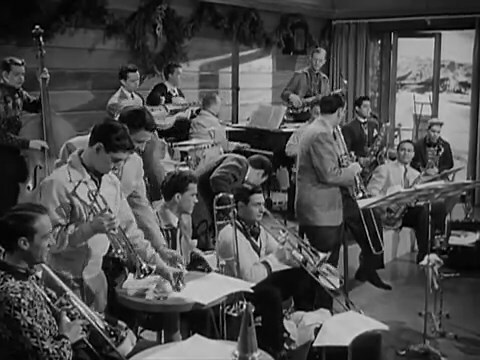 In the late 1930's, Miller finally acquired his own big band. His career led him from New York to Hollywood, where his orchestra played in the movie Sun Valley Serenade. They played the part of themselves working at a lodge and rehearsing for a performance. 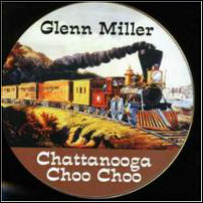 The scene from the movie shows Miller and his band playing "Chattanooga Choo Choo". 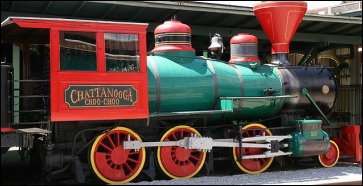 The instruments begin by playing what sounds like a train whistle. After they play the song, a small group sings it, then tap dancers dance to it. In the movie clip on the culture page, it is interesting to watch the band members interact with each other while performing. Glenn Miller knew that professional musicians become familiar with other performers' styles and are willing to learn from them.